Come join us at our annual conference for 2018. You can register for the conference here. Feel free to review the full agenda for both days of the conference or see details for day 1. VSHA is excited to announce Karen Anderson, Ph.D, a leader in the field of educational audiology, as the Keynote Speaker and Presenter. Dr. Anderson has worked in clinical, public school and state-level (EHDI) settings and currently is Director of Supporting Success for Children with Hearing Loss. Dr. Anderson is a past president of the Educational Audiology Association, has received national recognition awards in educational audiology, speaks nationally and internationally and served as an adjunct professor at University of South Florida. She is the author or co-author of many practical checklists, such as the SIFTER, LIFE-R, and CHILD and co-author of the book Building Skills for School Success in the Fast-Paced Classroom, Documenting Skills for Success, Building Skills for Independence in the Classroom, and Steps To Assessment: A Guide to Identifying Educational Needs in Students with Hearing Loss and author of a variety of other publications, including co-author of the e-magazine Teacher Tools. She is constantly adding information to the Supporting Success website. Click here for Dr. Anderson’s course description, agenda and learner outcomes. Dr. Rommy Fuller is a former classroom teacher and Wilson Instructor. Professor Fuller specializes in language and literacy for students of all ages. After obtaining a BA in Family Studies and a Master's in Education from the University of New Hampshire, Dr. Fuller taught in the public school system for many years. She holds a terminal degree in Language & Literacy (Ed.S.) through Simmons College and completed her doctoral work there as well. Now an Associate Professor of Education and the Education Program Director at Green Mountain College, she is enjoying the opportunity to share her passion for language and literacy with pre-service teachers. Aside from courses specifically geared toward language and literacy instruction, Dr. Fuller has taught a variety of different subjects at GMC. She is going into her tenth year as a professor and couldn't enjoy her job more! Dr. Fuller offers professional development for schools throughout New England and completes language and literacy evaluations for families and schools. Click here for Rommy's Dyslexia course description, agenda and learner outcomes. Shelley L. Velleman is Professor and Chair of Communication Sciences and Disorders at the University of Vermont. Her teaching, research, and clinical work focus on typical and atypical speech development. She specializes in pediatric motor speech disorders, especially Childhood Apraxia of Speech. She also studies the speech of children with neurodevelopmental syndromes such as Williams syndrome, 7q11.23 Duplication syndrome, and Autism Spectrum Disorder. She has authored many articles and three books on these topics. Click here for Shelley's course description, agenda and learner outcome. PLEASE JOIN US FOR A NETWORKING EVENT! May attend if you aren't attending conference. Registration required (no fee). Click here to register for this networking event. Come join us at our annual conference for 2018. You can register for the conference here. Feel free to review the full agenda for both days of the conference or see details for day 2. Dr. Katrina Fulcher-Rood, CCC-SLP is an assistant professor at SUNY Buffalo State. She currently teaches undergraduate and graduate courses in augmentative and alternative communication, assessment, language development, and speech-pathology practices in school-based settings. Dr. Fulcher-Rood's research interests include: examination of naturalistic communication of individuals with complex communication needs, development of technology for individuals with amyotrophic lateral sclerosis that is usable in daily conversations, investigation of clinical decision making in speech-language pathology, and creation of feasible research-based recommendations for use in daily clinical practice. Dr. Fulcher-Rood is currently a principal investigator for two internal college grants which examine diagnostic reporting in speech-language pathology, and assessment practices for English as a Second Language learners. In addition, she is a co-principal investigator for a National Institutes of Health Grant researching evidence-based assessments for Spanish-speaking children. Click here for Katrina's course description, agenda and learner outcomes. Melissa Clark is a new member of Nine East Network's Deaf and Hard of Hearing Program. Melissa received her Bachelor of Science degree in Speech Pathology and Audiology from Kent State University in 2010, and she received her Doctor of Audiology degree from Syracuse University in 2015. 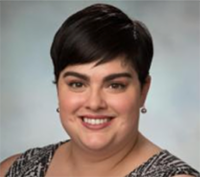 Melissa holds a Certificate of Clinical Competence in Audiology from ASHA (American Speech Language-Hearing Association), and she is a member of the Educational Audiology Association. Click here for Melissa's Roundtable Discussion agenda and learner outcome. Click here for Ellen's course description, agenda and learner outcome. Dr. Linda Hazard, is the program director for the Vermont Early Hearing Detection and Intervention (VTEHDI) Program. She earned her audiology degree from Boston University and a doctorate in Leadership and Social Policy from the University of Vermont. Dr. Hazard is also a consultant for the National Center for Hearing Assessment and Management (NCHAM) where she serves as the Region 1 Network Coordinator and mentors 7 states in quality improvement initiatives. Dr. Hazard was the President of the Directors of Speech and Hearing Programs in State Health and Welfare Agencies (DSHPSHWA) in 2016 and 2017. She serves on the American Speech Language and Hearing Association (ASHA) National Medicaid Committee, is one of the ACI Alliance State Champions for Vermont and serves as the Chair for the Vermont Deaf, Hard of Hearing and DeafBlind Advisory Council. In February of 2017 Dr. Hazard received the prestigious Antonia Brancia Maxon Award for EHDI Excellence and published a chapter on qualitative research for the EHDI I Book. Click here for Linda's Medicaid Presentation agenda and learner outcome.